The Race Screen displays during the event to show the user the progress being made. 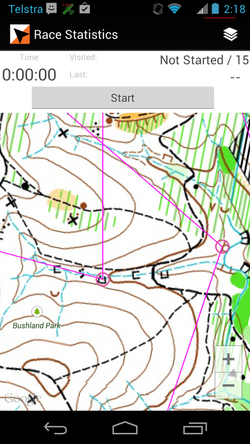 It shows a map view that includes the map that has been loaded (eg the Orienteering Map) and the course that has been load. It DOES NOT, show the user their location, or a recorded track of their movements. It has one large button which initially shows - Start - Use this to start the GPS before you approach the Start. If you have chosen Auto Punch mode, the button then becomes the Manual Punch button. When the GPS detects that you are at the start, it automatically starts the stop-watch and when you approach other controls the control is automatically punched. The timer will stop automatically at the Finish control. To exit without finishing press touch the Back button. If you have chosen User Punch mode, the button then becomes the Punch button. When you are at the Start, Finish or any other control, touch the Punch button to punch the control. If the GPS detects that you are close to a control MyOMaps punches the control. If the GPS does not confirm that you are at the control, you have the choice to either do a Manual Punch or to cancel your intended punch. The timer start when you punch Start will stop automatically when you punch the Finish control. To exit without finishing press touch the Back button. - Last visited control gives the number of the control that was last visited.